Were there any peaceful and legal methods of settling this dispute? The Orthodox, Conservative and Reform traditions of Judaism. Conservative, mainline, and liberal Protestant denominations, from the Southern Baptist Convention to the United Church of Christ; from the Jehovah's Witnesses to the Church of Jesus Christ of Latter-day Saints (Mormons). The monument could have be moved among all of the congregations in, say, alphabetic order, on a monthly, quarterly or semi-annual basis. The location in a given month could have be advertised in the local newspapers and registered with the local community information center. This would have given anyone interested the opportunity to view the monument for as long as they wished. It would have emphasized the common bond that these diverse faith groups possess. It would have taught the public about the religious diversity in America. The monument placement would certainly have been constitutional, since the monument would be located on privately-owned land. 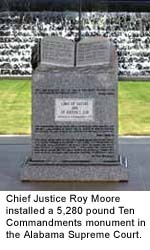 The monument would not be displayed in the Rotunda of the Judicial Building. Thus, this solution would probably not have been acceptable many of the protestors. Exodus 20:2-17 contains 19 to 25 separate instructions which various religions have grouped in different combinations into Ten Commandments. The monument is inscribed with the version of the Ten Commandments used by ancient Judaism, Protestant denominations, and Eastern Orthodox churches. The versions used in Judaism are grouped differently. The Roman Catholic Church and some Lutherans use a third grouping. It might create some friction if a Protestant monument were located at on the grounds of an Jewish, Roman Catholic or Lutheran congregation. Ur-Nammu's Code (the earliest legal code of which we have a copy. It is dated to 2050 BCE. The Code of Hammurabi. This is the second earliest known legal code, predating the Ten Commandments by almost 500 years. Some believe that the Ten Commandments were based on it. The Golden Rule of Christianity "Therefore all things whatsoever ye would that men should do to you, do ye even so to them." Matthew 7:12. An excerpt from "Principles of Humanism," by the Humanist Association of Canada: "(11) Humanists affirm that individual and social problems can only be resolved by means of human reason, intelligent effort, critical thinking joined with compassion and a spirit of empathy for all living beings. " Similar civil laws and secular codes of ethics. A cultural display including the Ten Commandments would probably be constitutional, if a sufficient diversity of items were displayed from both secular and religious sources. It would demonstrate the diversity of religious, philosophic and legal sources from which Americans derive moral and ethical guidance. It would not have had the monument being displayed in isolation. Thus this solution would probably not have been acceptable to many of the protestors. The simplest solution of all was to take up the offer of a church which is located across the street from the Judicial Building. They have offered some of their land to host the monument. This solution would have offered some of the same benefits, and have the same overwhelming disadvantage as the first alternative, explained above. When we wrote this essay in 2003, our assessment of the chances of implementing any of these compromises was essentially zero. It turned out to be true.